New research led by the University of East Anglia (UEA) reveals that sharp variations of the surface of volcanoes can affect data collected by monitoring equipment. The surfaces of many volcanoes feature steep walls or cliffs. These are often part of calderas—large craters left by a previous collapse—but can also be caused by the volcano 'rifting' - or splitting—or sector collapse, when part of the side of the volcano slides away. However, the effect of these variations in landscape has not previously been considered in studies of surface deformation in volcanic regions, even though they are a common feature. In addition, monitoring equipment such as tiltmeters are usually placed on caldera rims as they are often more accessible, especially if the caldera is lake-filled. Tiltmeters measure the horizontal gradient of vertical displacement and can emphasise small variations that go unnoticed using other monitoring methods. Now researchers from UEA, the US Geological Survey and University of Bristol have found that features such as cliffs can cause a reversal in the pattern of deformation, leading to misleading data being recorded by the tiltmeters. Their findings are published in the journal Geophysical Research Letters. The team studied Kilauea volcano in Hawaii, which erupted last April, resulting in a summit collapse that has reshaped the cliffs around the caldera. It now has near-vertical cliffs of up to 500 metres and terrace-like steps of 50-150 metres. The researchers say these new structures may have an impact on tilt measured at the existing network of tiltmeters and have implications for any new monitoring equipment that is installed. Lead researcher Dr. Jessica Johnson, lecturer in geophysics at UEA's School of Environmental Sciences, said: "Tilt measurements have played a significant role in the knowledge of volcanic processes on at least 40 volcanoes worldwide. Our analysis highlights the importance of considering surface features when assessing tilt measurements at active volcanoes, something that hasn't generally been taken into account. "While the inconsistent data at Kilauea cannot be completely explained by topography, it may have some influence. Following the most recent collapse at Kilauea this problem is likely to be even more pronounced and should be considered when new monitoring instruments are installed." The researchers investigated after finding anomalies in data collected from one of the tiltmeters on the caldera rim at Kilauea before the last eruption. They looked at whether this could be due to topography and found that the then 80 metre-high caldera wall caused data from one of the monitoring tiltmeters to rotate away from the true centre of deformation. "These findings have implications for network design and ongoing monitoring," said Dr. Johnson, who visited Kilauea last July and previously spent two years on a research fellowship at the Hawaiian Volcano Observatory. "They suggest that other tiltmeters around Kilauea and at volcanoes globally could be affected by caldera rims and other sharp variations in the landscape." Dr. Johnson added: "If this this monitoring method is already being used there are things that can be done to fix the data stream. If new tilt monitors are being installed then we have got to be careful where they are deployed." 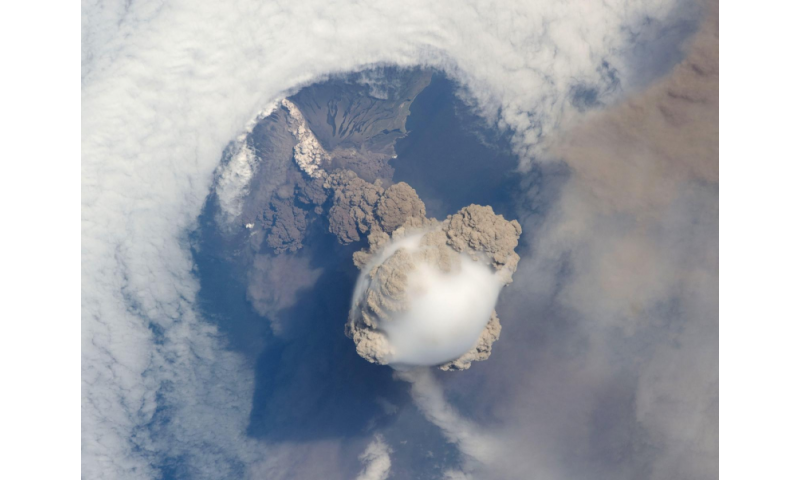 Co-author Dr. Juliet Biggs, from the University of Bristol, said: "Understanding what drives volcano deformation is critical for improving the interpretation of volcano monitoring data, and developing probabilisitic eruption forecasts. Tiltmeters are very sensitive to small changes in the volcanic conduit, but their measurements have been challenging to interpret. "This study sheds new light on how these measurements are influenced by surface features such as steep cliffs, and will undoubtedly improve our ability to interpret the complex monitoring signals." More information: 'A cautionary tale of topography and tilt from Kilauea Caldera', Jessica H Johnson, Michael P Poland, Kyle R Anderson, and Juliet Biggs, is published in Geophysical Research Letters.